Sunjang Baduk is one of the forms of Go, which was common in Korea through the 16th century and into the 20th century. 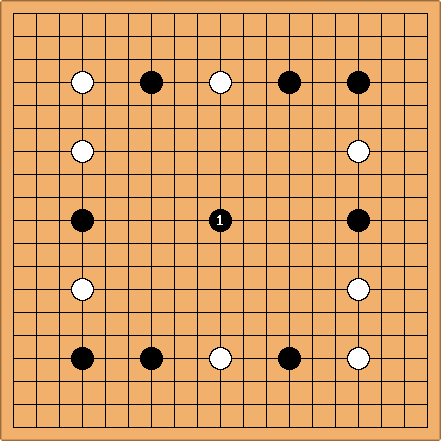 The first 16 moves are prescribed and Black makes the first free play usually at tengen. There are not enough specific records about komi in Sunjang Baduk, although komi of 4.5 was used in the mid-20th century. The final borders cannot contain any stone in atari, but may contain cutting points. They need not be continuous. Points are not counted in seki. GoGod article "Sunjang baduk still has lessons for today"
John Fairbairn discusses Sunjang Baduk on MSO. Yours truly has analyzed a ko fight in a PDF file there. There are a few examples of Sunjang baduk (up to first 200 movements) online, originated from a go magazine published in 1934.